One of the ways Aronson Security Group, a leader in Security Risk Management Services (SRMS), gives back to the industry is through our professional membership and leadership participation in PSA the world’s largest security cooperative of security solutions providers. TEC, presented by PSA Security Network, is the premier education and networking event for all security solutions providers. TEC features quality education and certification programs, networking, and dedicated exhibit hours designed to advance the skills and expertise of security industry professionals. This year we sent 25 associates to the forum. 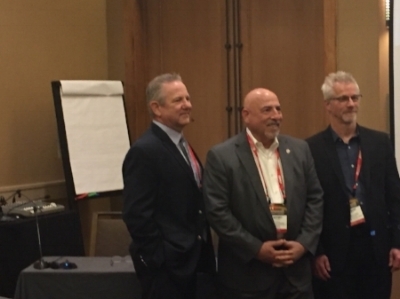 One of our executive management team members, Robert Birley, SVP of Engineering and Performance Management, teamed up with noted risk consultant Jeffrey Slotnick, CPP, PSP and the CSO and founder of Setracon, and the VP of Global Strategic Alliances of Zenitel, Dan Rothrock. They were asked to address the persistent need for security solutions advisors to develop evaluation criteria for the technology they represent, as well as to design a methodology for evaluating the risk and operational needs of their clients. The two go together. Otherwise solution providers simply are resellers who are more loyal to a product manufacturer then to their clients. Once the overall “As-Is” state of the organization and security program is assessed, the solution provider must have the means to vet technology before they agree to resell it or support it. This means they have a methodology for creating a scorecard for technology vendors within a ‘category’ such as access control, video management, and critical communications. The three presenters then went on to propose a high-level scorecard for critical communications that had three pillars. · Intelligibility. This term is called out by major standards bodies and refers to the ability to hear and understand; which are sometimes confused. Because of this confusion, the panelists noted, that many communication devices like intercom systems have not had appropriate benchmarking on their intelligibility. “Clients have mentioned to us that they purchased communication technology that was tinny and unintelligible”, said Slotnick. Case studies on the scorecard, its importance to the ROI and the value, and the lessons learned from failed implementations, anchored the rest of the presentation. A large hospital, global software provider, and education campus were profiled.